A stainless steel grater slides into an olive wood box for prep-and-serve perfection. Grate fresh parmesan, chocolate, nutmeg, and citrus zest with this prep-and-serve set. 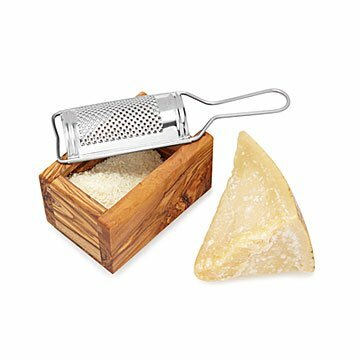 A fine, stainless steel grater slides neatly into the olive wood box, which collects your ingredients for cooking or taking directly to the table. The richly grained box is handmade by artisans in Tunisia from sustainably sourced wood. They only use trees that have stopped producing olives and plant a new tree to replace each one. It makes a functionally beautiful gift for any foodie. Handmade in Tunisia. Hand wash, but do not submerge olive wood box, grater is dishwasher safe. Occasionally coat with mineral or olive oil to prevent the wood from drying out. Designed for use with hard cheeses and dry ingredients. Perfect gift for the foodie who loves cheese! I think we will use a lot when hosting dinners. Very attractive and useful.